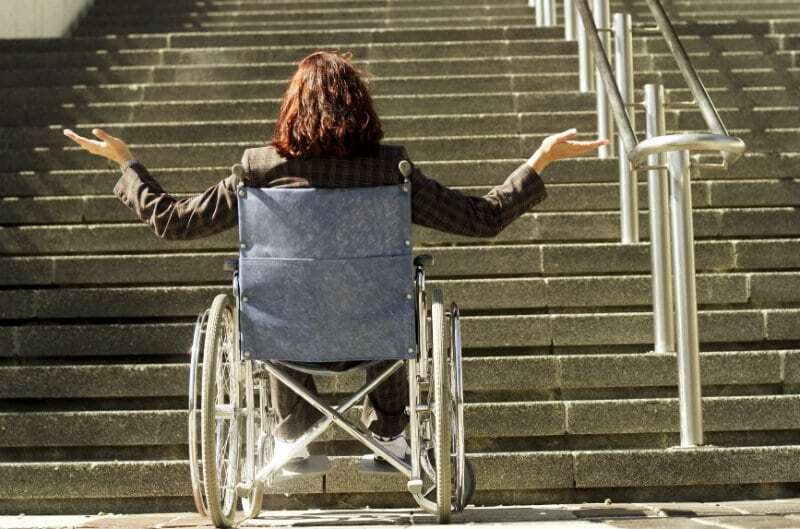 To be able to perform a wheelchair transfer up or down a set of stairs, it is important to have 2 people available to be able to help you in the process. You should not attempt this type of transfer if there are not 2 people available to help the user. The reason for 2 people being needed instead of just one caregiver, is because they will be balancing the weight of the chair so that you do not tip over backwards or fall forward on your face. The person using the wheelchair should be seated with their entire body fitting in the chair. A seat belt should be used in order to keep the patient/user in the chair while attempting the transfer. To begin this type of transfer one helper would need to be positioned on the stairs and hold the handles on the back of the backrest. This would be while while the person is positioned behind the wheelchair. The wheelchair backrest should be pointing towards the stairs in order for the 1st helper, positioned behind the user to be able to lift and pull the user up over the stairs. This helper, who is positioned directly behind the user, should make sure that they have a good grip on the handlebars in order to avoid endangering the user. The 2nd helper would be positioned in front of the wheelchair user. While facing the user, you should be face to face with them. The 2nd helper’s job is to provide support while the transfer is underway. This helper should hold onto the frame of the wheelchair, while making sure that their grip is secure and can be sustained throughout the transfer. Please always make sure you are not holding onto any components that are removable, this would raise the probability of losing grip and the user falling. Helper #1 and Helper #2 should both bend their knees while attempting this type of transfer. Helpers should lift with their legs and arch their back before lifting the wheelchair and user. Helper #1 should be positioned with one foot on the step above the wheelchair user, and the other foot one step above the other foot. 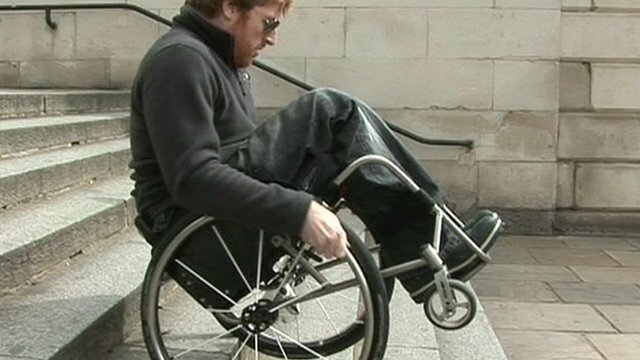 While in position, both helpers should tilt the wheelchair backwards to find the balance point before applying any pushing or pulling force. Helper #1 and 2 should collectively tilt the chair back. At this point the front wheels of the chair should be up in the air while the rear wheels handle most of the weight distribution. hile the front wheels are in the air should allow helper #2 to get a good grip on the front of the chair, the helper must make sure to have a sturdy grip before attempting the transfer. http://wheelchairstairclimbing.blogspot.com provides alternative ways to climb up and down stairs. They also include videos to make it easier to learn the different ways you can transfer.